Mini cams are nothing new , they have been in use for quite some time now. They have been referred to as Lipstick cams, pencil cams, pocket cams… the list goes on. They have been very pricey, and out of reach for the independent filmmaker, or even average consumer. However a manufacture has stepped in and made an fantastic camera that can be placed just about anywhere. These cameras are called GoPros. These small cameras have the ability to shoot full HD res at in stunning 1080p. These cameras can also support different frame rates as well as resolutions in a very small package. These cameras are mainly weather proof and shock proof. Making them really indispensable. GoPros can be attached to virtually anywhere. 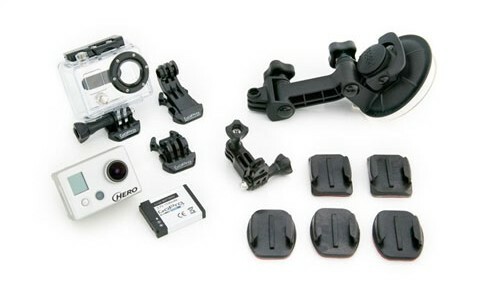 by attaching the camera to helmet while skiing or snow boarding you can bring the action a closer to the viewer. The audience can see everything that the skier sees, in traditional POV (Point of View). If you are looking to get some reaction shots of the skier’s concentration, simply position the camera towards his face. You will be amazed, and possibly tickled by the emotions displayed on their face. To get even closer to the action you can mount the camera to the base of the snowboard or skis to get that up close and personal view. It also gives you a great angle to see the skier in action. Just remember to mount it securely, and make sure your skier know how to ski. These cameras are great, but because they are inexpensive they are even better in twos. You and your friend can both have GoPros mounted to your helps or desire locations, and in a stance you can both be cameramen capturing each other ‘s moves on the slopes. This provides you with more coverage and fantastic footage. Plus you wont miss a moment of the action, especially if someone has a spill. GO Pros provide you with incredible coverage and their inexpensive, and almost indestructible nature makes them ideal for any kind of sports. Weather you choose to use them for shooting a car race, skiing or surfing. These cameras are outstanding. There is really no limit to what you can come up with these little HD cams. Check out the video below to see the GoPros in action. Want a computer that can edit photos and video like a pro? Look for laptop and desktop PCs with Intel Inside® for great experiences both at home and on the go. Great write up. I have to get me one of those GoPRos. Great write up! Thank you.